In summary, the banks wrecked the Greek government, and then deliberately pushed it into unsustainable debt … while revenue-generating public assets were sold off to oligarchs and international corporations. The rest of the article is about how and why. 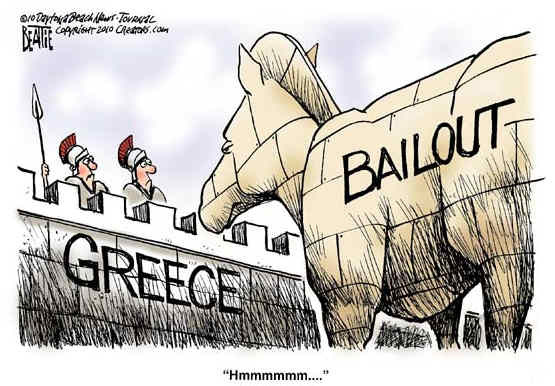 Greece — The One Biggest Lie You Are Being Told By The Media. I recommend the associated video: Confessions of an economic hitman. It’s 24 minutes long and explains how a global empire has been created by the oligarchs. The corporations identify a country that has resources that they covet. First they’ll arrange a huge loan to that country, but it won’t go to the people, it will go to corporations and infrastructure projects; things that will benefit the rich. But the whole country is left holding huge debt ….